Mayo Clinic's Kelly Curtis, M.D., and Megan LaChance at the Fiesta Bowl on Jan. 1, 2016. Megan LaChance used to dream of being a successful business woman. But a series of events, medical and otherwise, led her on a different path – an educational path that culminated with her sharing her surprising story at the Fiesta Bowl in Arizona on Jan. 1, 2016. Even though she's just 24 years old, Megan has had a lifetime's worth of trials and tribulations. When Megan was 19, she lost her mother to pancreatic cancer. At the age of 21, just two months after Megan married her high school sweetheart, she was presented with another challenge. Nagging pain that she believed to be caused by sciatica turned out to be advanced bone cancer. Doctors at Mayo Clinic's Arizona campus delivered the news. Megan would require an extended course of chemotherapy to shrink the tumor before she could have surgery to remove it. The chemotherapy cocktail was so powerful that Megan was cautioned not to kiss her new husband, as the side effects could be passed onto him. Even after chemotherapy, the surgery was extensive. The entire right side of Megan's pelvic bone was removed, along with part of her sacrum. Soon afterward, she was dealt another blow – one that must have been especially painful for someone who just completed cancer treatment. Doctors found Megan had a rare gene that causes Li-Fraumeni syndrome, which affects only about 400 people in the U.S. The gene could predispose her to breast cancer, brain cancer, leukemia and sarcoma. Megan returned to Mayo Clinic to confirm the diagnosis, and Kelly Curtis, M.D., a hematologist/oncologist, became Megan’s key partner in her journey, helping her absorb the realities of carrying this rare gene. As a first step, she decided to have her breasts removed as a preventive measure. “I will need to stay on top of this all my life,” she notes. Still, Megan prefers to discuss the upside of her journey -- her supportive family, friends and Mayo caregivers who have encouraged her through her trials. Foremost is Tres LaChance, her husband. “He was my rock,” she says, tearing up. Mayo Clinic nurses also score high on her list. “They are top notch, and I will love them forever — the same with the doctors,” she says. Dr. Curtis is among the caregivers who are just as impressed with their patient. He says he is impressed with Megan’s resiliency and ability to understand what her treatment program would require. “Megan has taught me that you need to cherish life — every moment — and to be there for other people going through challenging circumstances,” he says. Now Megan is using her experience to help others. She has a passion for educating others about the gene that has changed her life — and she wants to be there for young adults or children who are going through the same thing. “It's easy to say 'I'm done. I don't want to do this,'" she says. "But you need to fight and to have the rest of your life back." In January, the Fiesta Bowl was a big stage for her message. 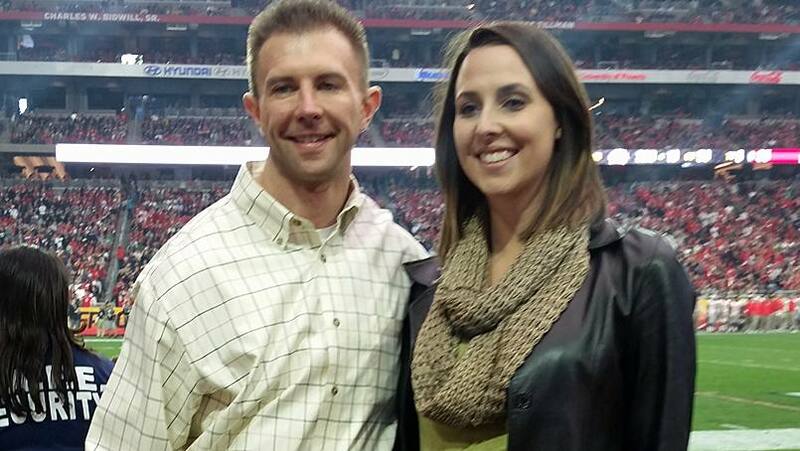 Megan, her husband, and Dr. Curtis were invited to watch the game from a suite at the stadium in Glendale, Arizona, and a brief video of her story was shown on the big screen. Following that the video, Megan, her husband and Dr. Curtis were brought down to the field to be recognized. Learn more about Hematology and Oncology at Mayo Clinic in Arizona. Learn more about Mayo Clinic's Cancer Center.